If you’re looking for a flexible way to make an income from your home office, a Search Engine Evaluator job might be right up your alley. Most companies that hire Search Engine Evaluators, also known as a Web Search Evaluator, do not require you to work a specific schedule, but instead send along evaluations projects as they become available. This leaves your schedule pretty flexible so you can pick the days and times you want to work, so long as you meet your project deadlines. If you have a knack for finding information online and know the general ins and outs of how web searches work, you could find a rewarding career as a Search Engine Evaluator. What is a Web Search Evaluator/Search Engine Evaluator? A Search Engine Evaluator job is much like it sounds. You’ll be evaluating search engine results for relevancy to a search query. Basically, you are given a search term and the results for that search term from a specific search engine, like Google or Bing. Then, you’ll determine whether the results are a good fit for the search term, or query. You base your evaluation on a number of factors and then rate a result based on your findings. That’s right – search engines still use humans to evaluate results because, believe it or not, technology isn’t always 100% accurate. Search engines use techie algorithms to help people find what they’re looking for, but they need humans to constantly test those algorithms to make sure that they’re working correctly. How Does Search Engine Evaluating Work? As a Search Engine Evaluator, you’ll be rating search engine results given to specific queries. Since this type of work reveals a lot about the algorithms of a search engine, you are required to sign a non-disclosure agreement before you begin work. This agreement states that you will not disclose any confidential information about a search engine’s algorithms or the specifics of the search engine evaluation job, including your pay rate and specific tasks. So, for the purpose of this article, I am providing public information about the search engine evaluation job. To get a Search Engine Evaluator position, you will go through a training process and evaluator test that will explain, in depth, your specific tasks. As a Search Engine Evaluator, you’ll be given a specific query, like “Dallas restaurants”. You would assume that this person is attempting to find a restaurant to eat at in Dallas, Texas. However, sometimes search engines give some wonky results. That’s where you come in as an evaluator to help search engines weed out the quirks in their algorithms. As a Search Engine Evaluator, you’ll be hired as an independent contractor rather than salaried employee. Most Search Engine Evaluators report making between $12 and $15 per hour, but the tasks can sometimes be few and far between. It’s important to think of this job as side income or part-time employment rather than full-time employment because your pay depends on the number of tasks available, how well you perform them accurately, and how much work you decide to take each week. Your tasks are also timed so you cannot go past a specific time limit. As you get more used to evaluating, this shouldn’t be a problem. But, take this into consideration, as it does affect your hourly pay. Still, several independent contractors for Search Engine Evaluator companies report making a decent part-time income. As with any job, the Search Engine Evaluator job comes with pros and cons. You’ll have to weigh them for yourself to make sure this job is a good fit for you. One of the biggest perks about being a Search Engine Evaluator is that you can pretty much do it in your own time. If you want a little extra money, pick up a few tasks after you get home from work or on weekends. Most search engine evaluation companies allow you to work anywhere from just a few hours to 20-25 per week. And, you can do it at home in your pajamas if you want! For those looking to make income at home without making phone calls or starting a business, this could be the opportunity for you. You’re also saving on commuting costs – there’s nothing cheaper than walking to your computer to work! Unfortunately, if you’re looking for steady work with a consistent income, search engine evaluation may not be the best choice for you. The number of available tasks can vary on a weekly basis. Some weeks, you could have plenty available and other weeks, a shortage. It’s not typically income you can rely on month to month. As an independent contractor, you’re also responsible for your own finances. That means no employee benefits or perks and you have to pay your own taxes. And, not only will you have to closely track your hours for your own records, but you’ll also need to track them to invoice the company so you get paid. Another con is that, when a company gives you your hourly rate, it’s not a very accurate rate. These companies actually pay per project. For example, they might say you’ll get $50 to complete a rating set. Suppose that set of tasks takes you five hours to complete. That brings your $12 to $15 per hour rate down to $10, and the company won’t compensate you any more than that. If you’re an efficient worker, you could end up with even more than the hourly rate you’re told. But if it takes you longer than the company expects for you to finish your tasks, your rate decreases. Finally, one of the biggest downsides I’ve found is the training for these jobs. Training is NOT paid for by the company, but you must complete it before getting hired on as an evaluator. In some cases, the training is intense and can take a few hours to complete. You’ll need to read a guide teaching you how to rate and then complete sample tasks to see if you understand the material. It’s not easy, and that’s a few hours you’re working that you don’t make any money. Unfortunately, going through training won’t even guarantee you the job. Some places do allow you to redo the training a couple of times if you don’t pass the first time, but after you continue not to pass, you won’t be allowed to work as an evaluator. Where Can I Find Search Engine Evaluator Jobs? There are several trusted companies who hire Search Engine Evaluators throughout the year. I recommend using Glassdoor to find some reviews from current and former employees of each company. You can also use the search feature to search for “Search Engine Evaluator” and find more companies that occasionally open up evaluator positions, some salaried and some contracted. I’d avoid looking on Craigslist and Facebook for this type of work unless you find it with a trusted company you’ve heard of. You can search on job search sites like Indeed but be careful to avoid potential scams that do exist on these sites before they get caught. I’ll get deeper into avoiding scams later in this article. Updated December 2018: Leapforce is now a part of Appen, which acquired the company in late 2017/early 2018. Through joining forces with Leapforce, Appen has become an even more prominent leader in the search engine evaluation industry, so it’s definitely an excellent time to try to join the company as an evaluator. Leapforce is, perhaps, the most well-known company hiring Search Engine Evaluators. Its current and former contractors report earnings of about $13-$14 per hour as a Leapforce At Home independent agent. Leapforce pays once per month via direct deposit. Payment comes within 30 days after you invoice them for your hours worked. It’s extremely important that you track all time worked accurately so you can get paid for every minute of every task. The Leapforce At Home independent agent qualification test is pretty in-depth and many people fail it the first go-around (or thereafter!). To have the best shot at passing the three-part exam, take a couple of days to really delve into the guide Leapforce provides. This will help you answer the questions and understand the rating system. Leapforce has mixed reviews from current and former contractors. Its independent agents love the flexibility, but say that tasks can sometimes be few and far between. Some also report that the independent agent rating process is frequent, and one bad review of your work can significantly restrict further opportunities for tasks. Check out the Leapforce At Home independent agent FAQ section for more information about this Search Engine Evaluator opportunity. Lionbridge offers several work from home positions all over the world, but they don’t consistently have open positions for Search Engine Evaluators. However, you can continue to check with its job opportunities page for Internet Search Evaluators and Internet Assessor positions. The Internet Search Evaluator position is Lionbridge’s Search Engine Evaluator job. As an Internet Search Evaluator or Web Assessor, you’ll be an independent contractor for Lionbridge. Current and former contractors report an average of almost $14 per hour for both positions. The Internet Assessor position requires you to rate online advertisements to help improve their quality. Think of it as a Search Engine Evaluator for advertisements. It’s a similar rating process and you’ll be looking for many of the same features to assess. To excel in either position, you should have familiarity with current news, pop culture, media, and cultural affairs in your country. This will help you better assess the online advertisements you’re given to evaluate. You’ll also need a working computer with internet access and an Android smartphone to complete mobile tasks. Lionbridge reviewers dislike the initial testing process and consistent review of performance. But for others, the ability to have a flexible schedule outweighed the cons. iSoftStone has Search Engine Evaluator positions available in different parts of the world at different times, so you may need to keep checking its careers page to find an open position in your country. Additionally, you can check job listings on Craigslist and Indeed, as it sometimes advertises open positions here. The reported pay rate for iSoftStone’s Search Engine Evaluator position is $12-$13 per hour. Its flexible schedule is a perk for current and former contractors, but some report that iSoftStone doesn’t give enough guidance to allow its contractors to excel at the position. As a Search Engine Evaluator for iSoftStone, you’ll be entering specific search queries into search engines and evaluating them based on the iSoftStone rating system. You should be able to use your own knowledge of what’s important and trendy in your location to accurately evaluate each result. iSoftStone provides free training and allows you to work between 10 and 25 hours per week on your own schedule. ZeroChaos employees report making at least $15 per hour, making this the highest reported salary for Search Engine Evaluators. ZeroChaos also hires for W-2 employees rather than independent contractors, which is a huge bonus for this type of work. It also pays its employees weekly, rather than monthly, like other companies. However, it can also affect the flexibility many want when they become Search Engine Evaluators. Workers report that they are required to work between 10 and 29 hours per week and you have to complete your assignments by a specific deadline. It doesn’t seem quite as flexible with pick-and-choose tasks as other evaluator companies allow. Your official title for ZeroChaos will be “Ads Quality Rater”. ZeroChaos typically advertises its positions on Craigslist or other job boards rather than its website, so check websites like Indeed, CareerBuilder, and FlexJobs for open opportunities. As an Ads Quality Rater, you’ll be responsible for rating the advertisements that come up in search engine results and on webpages. You’ll look for accuracy and relevancy to search queries as well as the quality of the ads. The reviews for ZeroChaos positions are similar to other Search Engine Evaluator positions: Flexible hours but not enough tasks to create a steady income. Appen is made up of a global network of virtual teams to help global markets create and implement new products and technology. It often has job openings for web search evaluators and social media evaluators in the United States. A social media evaluator is, basically, a Search Engine Evaluator that rates the performance of search results within social media networks. Appen requires you to commit to 20 hours per week, but you can be pretty flexible with the times you work. In the job description, Appen specifies a requirement of 4 hours per day, 5 days per week, but what days and times is up to you. The requirements for web assessor are similar to Leapforce’s: General knowledge of search engines, attention to detail, ability to follow instructions, etc. To qualify for Appen’s social media evaluator position, you should have vast knowledge of the major social media networks, like Facebook, Twitter, and Instagram. Preferably, you should be a daily user of these networks with your own accounts. Appen states that your performance will be monitored consistently and will affect your ability to qualify for new tasks. Most Appen reviews praise its evaluator positions as excellent work from home opportunities, but some call the work “tedious”. Yes, Google itself hires Ads Quality Raters to check its algorithms from time to time. If you want a chance to work with the king of search engines itself, then here’s your chance, although the jobs come few and far between and are very difficult to get with so many applicants (who wouldn’t want to work with Google?). Google’s rating jobs work similarly as other on this list. You’ll help fine-tune the search engine algorithm to make sure that the ads people pay for are making sense for the things people search for. You’ve probably seen ads on Google when you search for just about anything. Businesses and individuals pay for those ads to be placed near the top of search results to hopefully get seen by searchers first. Therefore, there’s a better chance people will click their links before other non-paid links in their search results. An Ads Quality Rater will evaluate not just how relevant ads are to various search queries, but also the quality of an ad’s landing page, like its images, text, and overall relevance to potential searchers. Google will provide strict guidelines for rating to ensure that all raters work the same way and rate ads the same way, but of course, the final feedback will be somewhat subjective. Unlike other rating jobs, Google requires that its raters hold at least a Bachelor’s degree and have college-level English fluency for both reading and writing. Some of these jobs are also bilingual, so those who speak more than one language may still have some opportunities (and they reportedly pay a little more). As I mentioned, it’s not easy to find these jobs. The best way to do it is head to Google’s Careers page and create and create an alert to notify you when new Ads Quality Rater jobs become available. When they do, Google will send you an email to let you know. The pay from Google is reportedly between $14 and $15 per hour and gets paid weekly. RaterLabs comes from Appen and is somewhat of the child between the merger between Leapforce and Appen that occurred in late 2017/early 2018. Upon entering the website, you’ll probably notice that it looks very similar to Leapforce. That’s because this site is basically what took over for Leapforce in the merger. Much of the tasks and process for applying are very similar. RaterLabs offers jobs in a variety of languages, like English, German, Russian, Spanish, and Arabic. You must be at least 18 years old to join the company. Of course, you’ll also need a high-speed internet connection, a reliable computer with updated software, and excellent research skills. Attention to detail is also a must to be able to follow along with the instructions for each task. It’s not consistent work. You may get loaded one week and have nothing for a month. Check job listings for each of these positions on their company websites or job boards a couple of times per week. Work from home jobs tend to get snagged quickly, so they may not be open for long. Try the search terms “search engine evaluator” or “web search evaluator” for best results. If you come across other companies that offer work from home search engine evaluator positions, feel free to let us know. Good luck in your job search! Just wanted to point out you have contradicting statements for iSoftStone. One sentence says pay is delivered via direct deposit twice a month and then the very last sentence says pay is delivered via direct deposit once monthly. Thanks so much. It is actually once a month- I have gone back and edited to reflect that. Thanks again for bringing that to our attention. Wow! We have some of the best readers here. Not only do they read and comment, but they also give us updates and feedback. Makes me proud to be part of the WAH world–amazing people! Excellent article. Thank you for pointing out which companies are no Compete. This was something that I was wondering for a long time. @ Cheryl – Thank you for commenting. Yes, sometimes these companies are so similar that it is hard to keep them straight. Are these companies hiring in Canada ? You have the pay wrong for at least one of these companies. @kim – I just try to give an approximate amount. Feel free to elaborate. Thanks. I noticed you don’t have pay info listed for Appen. I’m a current employee (Ad Evaluator). the pay is $11/hr every 2 weeks. I’m sorry but you’ve got some wrong information there about Appen. They do NOT pay $25 per hour, they pay $13.50. Hi everyone. After passed the qualification at Appen you will have to sign up at Payoneer to receive the payment. If you want to get $25 you can sign by my link then we both win this bonus. @Souj – Appen has been consistently scaling back on workers and pay has been my understanding. There are many threads on this at WorkPlaceLikeHome. Things always change in the work-at-home world. I agree with Souj. I have worked for Appen for nearly two years, and the base rate for the Evaluator position is absolutely NOT $25 per hour. There are some people that do certain crowdsourcing tasks and can make around $25 per hour, but usually not consistently. The base rate is a little more than half of the pay you stated in this article. Also, those doing the Web Search Evaluator position at Appen are only paid once per month, not bi-monthly and direct deposit is an option. @Celeste – Thanks for the information. In the WAH World things constantly change, and while we try to be accurate–some companies are not as easy to research or interview for various reasons. So, we really do depend on the great readers like you to help us out. Again, thanks. @Shawn – It says “between” $13 to $15 an hour. I like to give a “median” average. Thanks for commenting. Do you enjoy LF? Its a great gig, I have been with them since April of 2010. The only thing that was hard getting used to is not having a boss hanging over you to finish your work. Being a self starter is a must if you want to do well. I’ve been with Appen for a week now doing crowd sourcing and I am making $7 an hour. Devastating! Barely any work also. I currently work for Leapforce. Pay is $13.50 per hour and I wasn’t offered any options of position type. There could be other positions but I haven’t heard of anyone being hired recently for anything that pays over the $13.50. Still, I consider this good pay for WAH. I applied to leapforce 3 months ago and up to now I haven’t gotten an answer. How long do they usually take to respond? @Levi – Good attitude and glad that you are still enjoying the job. I’ve been hearing about quite a few companies that have cut the pay from what it used to be. These are not just search engine evaluating jobs either. I am thinking of applying at appen butler hill for there crowdsourcing job is it worth it you believe? I really need to maker extra money and find a part-time job and willing to do this. What is the average hourly wage for that type of work do you know? One person said on here $7 an hour? So is it anywhere between possibly 7-25 an hour in that range then to be a good guess? does the company pay on time and not having bounced checks etc? Is it legit you believe? Appen Butler Hill is legit and the pay depends on the project. Crowdsourcing pays per task whereas as an evaluator you get paid by the hour, e.g. a contractor in Germany used to make 21$/hr before taxes 2yrs ago. Also Appen is more about temporary projects you get assigned to and also more predictable which type of task you work on in contrast to LF. LF was pretty bad when it came to reviewing tasks, they expect raters to sometimes review/correct/justify ratings for free. LF tasks more than often had unrealistic time windows whereas ABH offered doable tasks with fair payment. I want to apply for one or maybe two of these jobs but I dont know which one could be better, which ones provide the best environments. I hope somebody could give me an opinion. Thanks. @Martin Hernandez – why not apply to both and see what happens? There is no experience greater than first hand experience. Appen does NOT pay $25 an hour. It is $13.50! I know others have pointed it out but since you seem determined to stand by that for now I thought I would let you know too that it is incorrect. This article mentions Search Engine Evaluation positions a lot, so my question is : are all these companies offering Google related jobs or are there other employers ? Provided I have been hired by ZeroChaos twice to work as a Google ad rater, this position is now definitely closed to me. Who work for Appen, please tell us if they pay $13.75 in US dollars or Australian dollars? I’m in the U.S. with Appen and make $11/hr and there are barely ever tasks. True! Same for me as well, $11/hr and barely any work. The avg is about 7 hrs/wk and they will penalize you for anything. If you have any time discrepancies, you will be written up. If you make many mistakes, you will be notified and warned of the company’s immediate termination policy. You can’t drag hours out and you can’t blitz through. If you need help or clarification, expect short responses from the admin teams. Help yourself; follow the rules; don’t expect much pay and you may be surprised from time to time that there is work. I have a question about these services. Do their apps/websites (however the interface works) measure your time for invoicing or is something you need to do yourself? It’s fine either way but I would honestly prefer that they measure the time. When I worked for Leapforce, I had to track my time myself. Hello good afternoon !! I am omar and’m Mexican I have some doubts in these jobs that you recorded there some extent not to hire me to live in mexico ?? i read something about that in Mexico and much of the world is restricted Leapforce but I find myself being evaluated tomorrow I have my exam contrarian not understand me if I pass the exam or you are saying? I recently worked for Zero Chaos. The pay was 15.00/hour, and it was paid every Friday by direct deposit. The only bad thing about it is that I was given 1 day notice to my assignment ending. So, that was pretty bad. I had applied to Zero Chaos as an ad quality rater. I would like to know how long should I wait before getting a reply on my application? I’ve heard of response times varying at Zerochaos (which is the former WorkForceLogic company). When I applied, they got back to me within a couple days, possibly within 48 hrs. Working for them is very easy but I do worry about a sudden termination like I have read about. 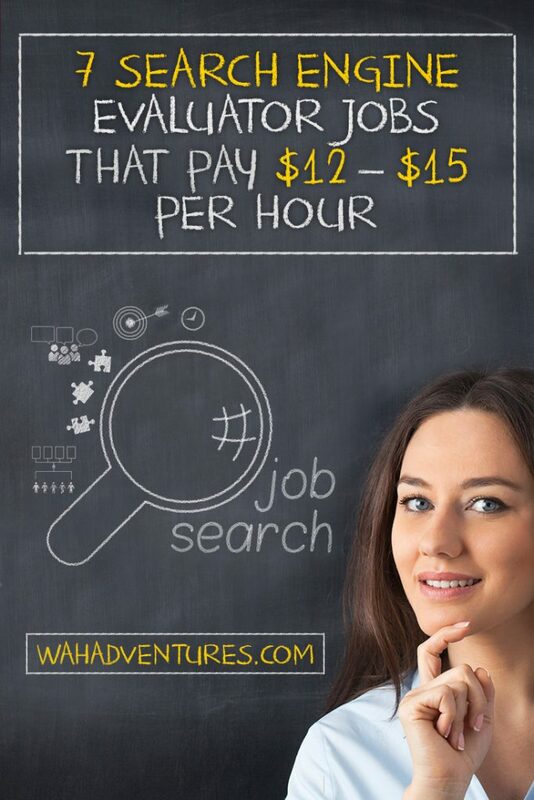 Hi I work for both Leapforce and Appen and the pay is is $13.50 and $13.75 , I wish it was as high as you have listed. I do search analyst and social media analyst jobs. Hi I work for leapforce now, so is it allowed to work for both leapforce and Appen? If we can also apply for lionbridge? I know it’s been awhile since you asked your question, but I can tell you that Appen does NOT care if you contract with other companies. I asked my project manager and he clarified that for me. I’m not sure about Leapforce, but I know Lionbridge does consider it a conflict of interest to work for any of the others. I could not clear leapforce exam & appen doesn’t allow ,e to work with any other site, So please let me know if there is any other new addition to the list of crowdsourcing or search engine evaluation job openings. I worked for Lionbridge for 2 years as an Ad Assessor. I made $15/hr and it was nice having flexibility. My biggest complaint with them is that I got an e-mail at 4am today stating my services were no longer needed. It was my biggest fear, that I wouldn’t receive any warning and it just happened. Why are these companies making it so challenging to apply for essentially two ticks above an entry level position? I just spent the past 14 hours doing pre-employment assessment for two different companies. Have friends that are in professional field that never went through this much pre-employment screening/testing/quizing/assessments… I consider myself a pretty intelligent person but if I fail one more assessment, I may give up entirely on this at home work…From what I read, they keep lowering the pay rate! So expecting more and paying less? Extremely frustrating to say the least. I don’t know exactly what they’re looking for but they’re never going to find that 99% candidate…. I worked for LF for several months, but found that the time allocated for tasks was in many cases ludicrous. For example, they would allocate 3 minutes, but it would take me at least a minute to read the directions. [In case you’re wondering, I have a Ph.D. and read pretty quickly.] This was frustrating. It was also irritating that whenever I sent them a question, I was referred to the FAQs. Not every query can be fitted into a FAQ. Fortunately, I secured a full-time teaching position and could leave LF. BTW – LF does not allow their people to work for other search engine evaluation companies and they do require you to do a minimum of 20 hours/week. ZeroChaos has a non-compete, and no warning time on the job ending. Are these companies still recruiting contractors? I’m interested in working at home. What are the qualifications and what do you have to do for the job?